Director – Joe Pearson, Screenplay – David Abramowitz, Story – David Abramowitz, Joe Pearson & Leon Tan, Producers – David Abramowitz, Mike Bloemendal, Joe Pearson & Leon Tan, Music – Luka Kuncevic, Animation – Sun Min Image Studios Co, Ltd (Animation Directors – Ki-Jun Kim & Kwang-Seock Yang), Tripod Entertainment, Animation Director – Young Han Sang, Production Design – Spencer Ooi, Chia Wei Seong & Tiok Ngee Seong. Production Company – Tripod Entertainment. In 1899, young Eric Wells is witness as his parents are incinerated by a heat ray during the invasion by the Martian war machines. In 1914, humanity has built a vast international war effort to prepare against any future Martian invasion, including having constructed weaponry adapted from the Martian technology. Eric is now a captain in the army and leads a troupe that have trained in the use of manned battle robots armed with heat rays. In New York, Secretary of War Teddy Roosevelt warns that Mars is nearing in conjunction and could presage a second Martian invasion. With the outbreak of war in Europe, the German contingent prepare to leave to join the fight but Eric stands up to say that the real enemy is the Martians not each other. They are about to begin test manoeuvres when a Martian outlier force arrives and they are forced to engage in combat. Everywhere across the USA, Martian war machines start to arrive and all-out war begins. This is a sequel to H.G. Wells’ The War of the Worlds (1895). The Wells novel is a literary classic and has hugely formative influence on science-fiction literature for the simple reason that it was the first alien invasion story. It has attracted a good deal of attention in the media from Orson Welles’ famous 1938 radio version, to Jeff Wayne’s best-selling musical LP War of the Worlds (1977) – from which we get a cover version of the song Forever Autumn over both sets of credits in this film – and a number of comic-book and graphic novel adaptations, most notably Marvel Comics’ Killraven (1973-6). The first of the film versions was the George Pal produced The War of the Worlds (1953), which is an equally influential work over the science-fiction genre and kicked off the alien invader fad of the 1950s. This later led to a tv series sequel War of the Worlds (1988-90), which had little to do with the film or Wells. 2005 featured no less than three different film versions of the book with Steven Spielberg’s high-profile War of the Worlds (2005), Timothy Hines’ cheap but extremely faithful and Victorian-set The War of the Worlds (2005) and The Asylum’s modernised mockbuster War of the Worlds (2005), which also led to a sequel War of the Worlds 2: The Next Wave (2008). War of the Worlds: Goliath is a sequel to the Wells novel that comes unconnected to any of the previous film versions. It comes from the pen of David Abramowitz who has mostly written for television, including working as a story editor on V (1984-5) and a writer/creative consultant/producer on the tv incarnation of Highlander (1992-8) and Highlander: The Raven (1998-9). Joe Pearson has a career as an animator and occasional director on various animated tv series. Abramowitz and Pearson clearly teamed up when the former wrote and the latter producer/supervised the animation for Highlander: The Vengeance (2007). (The film also features a number of voice actors who had previously worked on the variations incarnations of Highlander). Creating a sequel to The War of the Worlds is a hugely ambitious task. It is however one that Joe Pearson and David Abramowitz seem to take on in interesting ways. They create an imagined alternate history that might have followed if Wells’s Martian invasion had occurred. The script readily namedrops historical figures of the era such as Teddy Roosevelt, Manfred von Richtofen (aka The Red Baron) and Nikola Tesla, all of whom are now fighting for the Earth defences, while the film also ties in the outbreak of World War I with the assassination of Archduke Franz Ferdinand as backdrop. (The script also has the IRA present, although this would be historically inaccurate for the stated 1914 date as the IRA was not formed until 1917). There is a fascinatingly designed Steampunk world that might be imagined if humanity had built on the Martian technology – a glorious-looking New York with monorail systems and Zeppelins tethered to skyscrapers, and the opening post-credit scenes with Eric riding through the city in the train with the Red Baron zipping alongside in his plane. 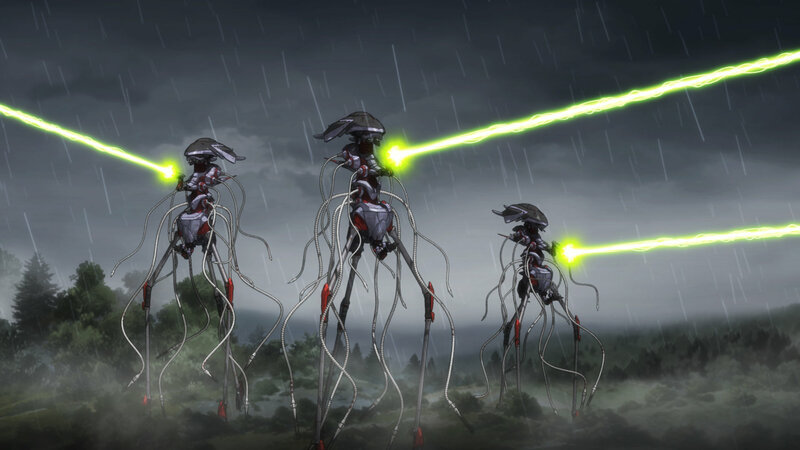 Essentially, War of the Worlds: Goliath has been conceived for the purpose of putting together a series of battle scenes with Steampunk mecha going up against Martian tripods in combat. Joe Pearson delivers a good many of these scenes and they are epic and exciting. It is hugely thrilling watching the massively scaled combat scenes – of machines blasting each other away, Zeppelins coming into the action, the march on New York and the climactic battle with the Martian mothership. It is the same kind of thrilling buzz you get watching giant-scaled anime films with massive hardware bashing each other to pieces. The animation is also not exactly family friendly as we get several scenes where the heat ray is seen to be incinerating people to the skeleton.